Asteroid Base will be at GDC from March 25th – March 29th. 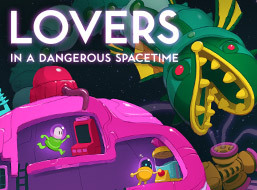 Lovers in a Dangerous Spacetime will be playable at our booth in the IGF Pavilion in the South Hall during the Expo’s hours. Update: We are proud to announce that we will additionally be exhibiting Lovers at Unity’s booth right in front of the main entrance to the Expo. Press Update: We are setting aside the hours of 2pm – 4pm on Wednesday, Thursday and 2pm – 3pm on Friday where the whole team will be available to talk to at the IGF Pavilion booth. All other times during the expo we will try to have one of us available.